BREAKING: Sky Sports are claiming that police are investigating an alleged assault by Joey Barton on Barnsley manager Daniel Stendel at Oakwell after Barnsley's 4-2 win over Fleetwood Town today. Jeff Stelling just announced on Soccer Saturday that police are investigating an alleged assault by Fleetwood manager Joey Barton on the Barnsley boss. 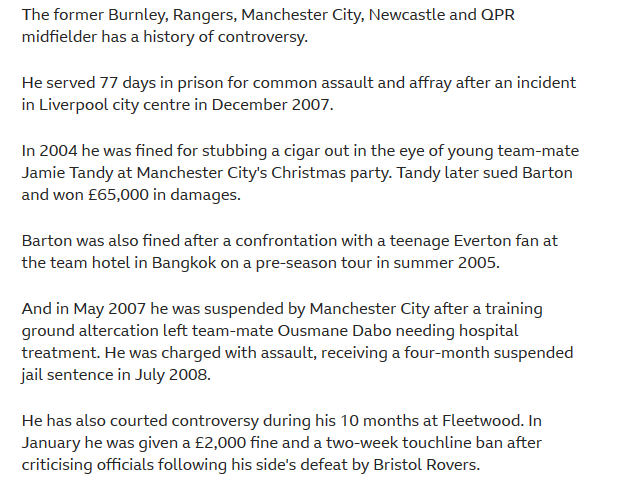 That guy at the villa game got jailed Barton needs the same and banning from football for life if true. Joey Barton will escape any immediate sanction from Fleetwood Town as the club awaits the outcome of a police inquiry into an alleged assault on Barnsley manager Daniel Stendel. South Yorkshire Police confirmed they were "thoroughly" investigating the tunnel bust-up after witnesses reportedly claimed Stendel lost two teeth as he was punched and head-butted by Barton. However, Fleetwood are in no immediate rush to discipline their manager, with club sources casting doubt on the veracity of at least some of the allegations. One told the Daily Telegraph that "80 per cent" of claims were inaccurate and that the truth will "come out in the wash". Barton's career has been marked by controversial incidents. In December 2004 he was fined six weeks' wages for stubbing a lit cigar in the eye of a young team-mate during Manchester City's Christmas party. In May 2007 he was suspended by City after a training ground altercation which later led to assault charges and a suspended four-month jail sentence. the German met officers at Oakwell on Monday. Barton is confident he will not be sacked by Fleetwood chairman Andy Pilley, but the Football Association will this week launch their own probe into what happened and are seeking witness accounts. So a headbutt in the face has already turned into a barge. Maybe a bit of argy bargy in the tunnel? Feckin click bait shite I reckon.